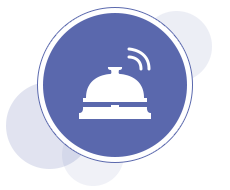 Oracle Hospitality delivers a wide range of software, hardware, and related services—along with a rapidly growing portfolio of cloud solutions—to enable our customers in the hospitality industry to provide superior service and experience to their guests anywhere. Hotels worldwide, from the smallest independents to the largest chains, use Oracle Hospitality to manage their operations. Our flexible, reliable, all-in-one solutions provide hotels with everything they need, from property-management applications and point of sale for restaurants and bars to distribution and marketing.